These small northern peoples are situated in the Far East, with the largest number of people belonging to the Evenks and Nents and the smallest group being the Enets people and the Oroch people. These northern groups are more or less exclusively nomads. Their small number is determined by the limited economic diversity of the Taiga and by what a hunter needs for feeding his family and by the farming area for the reindeer nomads. These people lived, apart from fishing, mainly on producing furs and hunting sea animals and gathering fungi, berries, nuts, algae and medicinal plants. These nomadic groups are still living in tents, so-called jarangas and also tschum, which are covered with reindeer skins. They moved around using sleighs with wide gliders, the narty, which may also be pulled along in summer over the moist grounds of the Tundra. The religious world is marked by Shamanism having a variety of mystic and cult actions performed. In Siberia and in some parts of Mongolia, the ursa, also called chum, as it is known in other languages, is an alternative to the ger (home/house). The nomads near the Polar Sea used this tent form, spanned and covered by Karibu skins, such as the herdsmen in the Sayan Mountains (Tsaatan reindeer breeders). It is designed as to being easily transportable. Especially the Samoyeds, the Evenks, the Chuckchi and some other peoples use such housing forms; and also the peoples living in the Arctic area at places high up in the north on the Jamal Peninsula (see map). 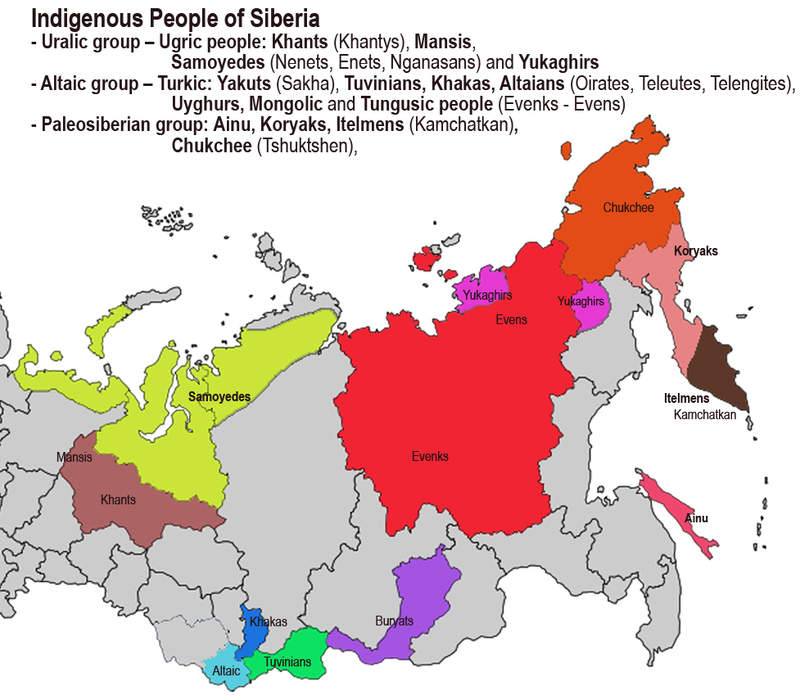 The largest groups settling in western Siberia are Ugric tribes; the Khanty, the Mansi, former Voguls or Ob-Ostyaks, live in the forrested Taiga in western Siberia. Their neighbour are the Samoyeds (Nents and Selkup people) in the north who predominantly live on reindeer breeding. These all belong to the Uralic language family, which includes the Samoyed as well as the Finno-Ugric peoples. In the steppes and forest steppes of Southern Siberia, there are mainly settling Turkic speaking tribes, which also include the Tungusic-Manchu speaking indigenous populations. Among these, the Altai people (Altai-Kizhi), the Khakass and the Tuvins are considered the numerically largeste groups. The Altaic language family comprises today all tribes belonging to a Turk-Tartaric, Manchu-Tungusic or Mongolian language. Turkic peoples also comprise the Yakuts (Sacha) originally settling at the Upper Yenisei River, who have migrated to the north on their horses. In the vast areas of the Taiga and the coniferous Tundra to the east of the Lower Yenisei, there have always been settling forest hunters and reindeer breeders like the Evens (Lamuts) and Evenks (Tungusic people). Another rather large group In the East-Siberian area are the Mongolian-characterized Buryats in the Baikal region. In the Amur region, there are the Nanai, the Ulch people and the Gilyaks, who also belong to the Paleo-Siberian peoples, such as the Chuckchi people settling in the north-east of Siberia, the Koryats, the Yukagirs and the Ainu, who all are actually direct descendants of the Siberian indigenous population. An exception thereto is a small group in the Central-Siberian area, the Kets, which belong to a Tibetian-Burmese language family. They are associated with this Paleo-Siberian indigenous population. In the 17th and 18th century, there were still present at the western shores of the Central Yenisei numerous descendants of these tribes such as the Kotten, Assanen und Arinen. The concept and ideal we nowadys have has been developd by several comparisons spanning generations. 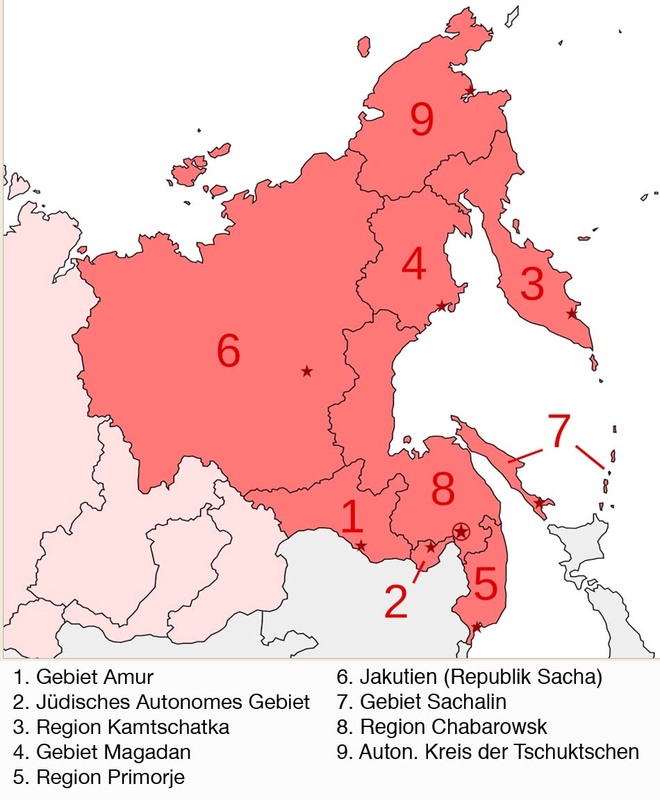 "Uralic" is considered a language family, the members of which originally belonged to a uniform indigenous language: the separation line thereof often separated even families into the Finno-Ugric in the west and the Samoyedian in the East. This language family covered a territory between Fenno-Scandinavia (Baltic region) and an eastern area in Siberia (Baikal region). The most probable original settling area of the Samoyedic-Uralic might have been the territory between the rivers Ob and Yenisei in Siberia. These groups were not "completely" uniform but rather diversified in dialects, such as any other natural language. There were existent branches within one family, such as the Samoyed language with its immediate neighbours in the west, the Khanty, the Mansi and the Permic people in the eastern Ural area. Although there was recognized a true entity within the Uralic, many details of this language community still seem to be unsolved, in particular the aspects of dates and localization. Today there are known some 6,000 to 7,000 spoken languages, which have about 400 to 500 separated lines or family. The Uralic language with its 30 to 40 language branches was somehow larger than an average family. Due to the number of people speaking an Uralic language, it was a relatively small unity in regard to its territorial expansion, but one of the larger families on our planet and an "old" family, this is, being developed a very long time ago. One of the important unsolved questions regarding human language is its development in pre-historic time, in a society of hunters and gatherers within the Boreal eco-system in Central Asia and Eurasia. An essential factor for such a change seems to have been at least with many "old" language families that there has been existent a so-called evolution, this is a rapid development within the economy in combination with increasing affluence, especially agriculture and selective breeding, and, in connection therewith, a subsequent enormous increase in population as well as social changes. It is especially important to note that the development of today's big language families is not necessarily to be ascribed to migrations or catastrophies. Main processes were the consequence of language assimilation or language shifts, whereby the diversity of languages has become extinct in favour of an expansive family. This means, hence, that genetic diversity has become extinct, this is the number of branches of a language family, with the number of separate languages remaining relatively stable. For this reason, there were to be found many languages in pre-historic times, assuming that the population in total reached several millions in the Neolithic period, even many more. This seems to be a reasonable but rather unprecise estimation if we assume that the average language society consisted of about 500 people. There may have existed, though, more than 10,000 actively spoken languages in the period before the development of the language families that are known today. It is, however, difficult to estimate how many lines these pre-historic languages had; the number thereof, however, must have been by far larger than it is today, as the conditions for the expansion of language were rather unfavourable. All pre-historic languages more or less had the same chance in their lines from ancestors to present representatives, but only a few of these actually succeeded and survived. It could be said that all pre-historic languages were permanently threatened by extinction, just as it is the case nowadays. In this sense, Uralic had been an "endangered" language until it stated to expand and spread. It is, however, without any doubt that Uralic languages with the so-called Altai languages, including Turkic, Mongolian, Tungusic, Korean and Japanese, belonged to a trans-Eurasian belt. In this case there are parallelities with their neighbouring ones, so that this area may be designated as a Uralic-Altaian language. Deviations may be found especially with the prototypcial Uralic-Altaian language, and these only in some branches, especially in the West with the Finnish, Sami and and in the North with the Samoyed languages; in the East with the Korean and Japanese languages; there may, however, still be observed a fundamental typological orientation within this trans-continental border area. The Uralic-Altaian border area is defined by clear areas which determine a language type against its neighbours, in the north with the Jukagyr, Chamchuck, in the south with the Indo-European, with the Sino-Tibetians as well as in the Far East with the Ghilyak languages of the Nivkh people and the Ainu. Along the fringe areas of the Uralic-Altaian border line there may be observed some examples of incremental assimilation and adaptation, such as in the case of the Northern Chinese or of several Turk and Mongolian tribes in the region Amdo Qinghai. It is to be noted that there were further existent parallelities in area and typology, with reference to the Uralic and the non-Uralic-Altaian neighbours thereof, especially with the Indo-European language family. Uralic and Indo-European families are important, as well as Turk, Mongolian, Tungusic, Jukagyr, Amur (Ghilyak) and Chamchuck languages; they all belong to the so-called Mitian language, wherein there were contained the roots of the personal pronouns, which are used - as in may other languages - as personal markers. This language community among the Uralic speaking population was associated with a variety of factors pertaining to other fields than language, it was connected with economic and population growth, influenced by cultural and political conditions. If only numerical proportions were considered, we could conclude that the original Uralic language was very similar to the modern Hungarian language. We do, however, know that the Hungarian pronunciation did constitute a local complex, by its physical contact with the Central European. These particularities are also existent in the neighbouring languages, including the Roman, Serbian and Slovak languages. There is not nearly a Uralic speaking population that is farther from this Proto-Uralic than the Hungarian language. Another similar example of another language family: the Turkish language is nowadays the "largest" Turkic language in regard to the number of people speaking. This could lead to the wrong implication that the modern Turks in Turkey represent a physically "original" type of the Turkic speaking people. Nothing, however, is less true, as in fact Turkish was only spoken in the second half of the first millenium B.C., and predominantly by the "Asian" population settling in the region of today's Mongolia. Due to demographic, cultural and political reasons, the Turk languages then spread in Central Asia and Eurasia as far as Turkey, while in Mongolia these languages were more or less extinguished by the expansion of the Mongolian language family. It could be said that the modern Mongols in Mongolia are more or less direct descendants of the old Turks, while the modern Turks in Turkey are more or less a direct continuation of an old local population in Anatolia, who have historically included a number of non-Turk languages, i.e. the Hattic of the Hattians or the Armenian and the Byzantine Greek languages. We do not exactly know whether a first development of a Proto-Uralic language also included branches oriented towards the west, it is, however, still possible that a Proto-Samoyed family moved eastwards, while a Proto-Finnish-Ugric family remained in its original position. 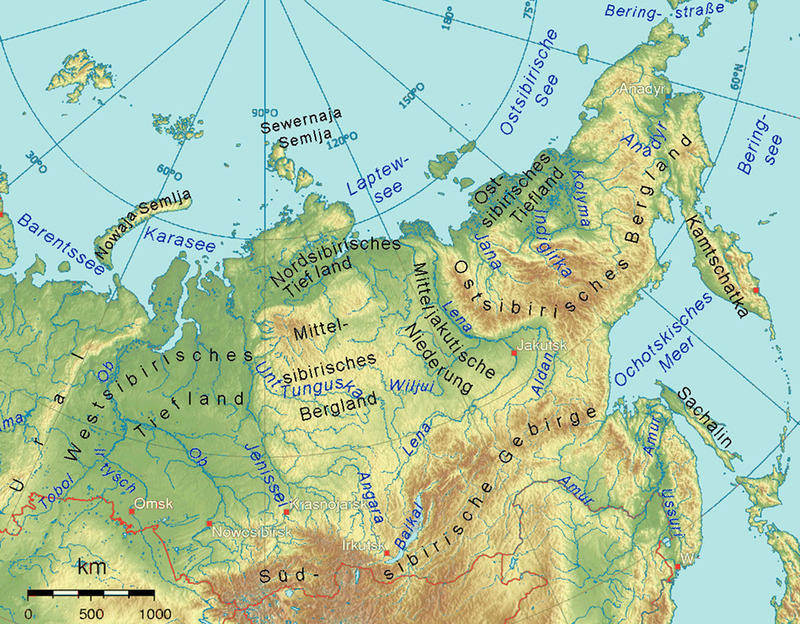 It is, however, notable that in the Minusinsk Basin at the Upper Yenisei there could be developd a Proto-Samoyed language for the very first time. This area represents a compact region having an extraordinarily well documented sequence of archaeological cultures, starting in the Copper Age over the Bronze and the Early Iron Age with the cultures of the Afanassiewo (3500-2500. B.C. ), Okunewo (2500-2000 B.C. ), Andronowo (2000-1400 B.C. ), Karasuk (1500-800 B.C. ), Tagar (900-600 B.C. ), Pazyrik (600-200 B.C.) and Tashtyk „Hunno-Sarmatian“ (100 v. Chr. - 200 B.C.) up to the Yenisei Kirghiz (from 400 A.D.) to the Mongols (from 1300 A.D.) on and later the conquests of the Russian Tsars (from the 17th century on). Without turning to the question of a probable Proto-Uralic presence in the Minusinsk Basin, it is relatively safe to say that the ethnolinguistic history of the region is to be viewed backwards, leading to the invasion of the Turkic (later Yenisei Turk), which was terminated by a Tashtyk (or Hunnitic) period in this region. The historic distribution of the local ethno-linguistic groups strongly emphasizes that the dominant language in the Minusink Bais before the Turk lingua was the language of the Tashtyk culture, following the Tagar culture; wherein this is supposed to have had Samoyed elements (Proto-Samoyed language). There have been speculations on the possible language identity of the Karasuk, Andronowo, Okunewo and Afanassiewo culture, while nothing really can be documented for sure. Also Indo-German elements in the Samoyed may indiciate that an early form of an eastern Indo-European (Proto-Tocharic) language was present in the region, either in the advance of or concurrently with the Samoyed culture. The Nenets have their origin in the Altai-Sajan Mountains and then assimilated, after moving downwards along the River Ob, with the fishers and hunters settling there. They still live as hunters and breeders along the Arctic coast in the west and east of the Ural. The Nenet people have been endangered by the exploitation of the huge oil and gas extraction which promotes the large-scale destruction of the grassing areas for reindeers. The Khanty and the Mansi people (earlier Ob-Ugric - Voguls and Ob-Ostyaks) developed out of the combination of autochtonous fishing and hunting tribes with horse breeders from the Central-Asian area, the Upper Irtysch, who moved northwards in the middle of the 1st century A.D. They have settled, e.g., in the central Ob area. 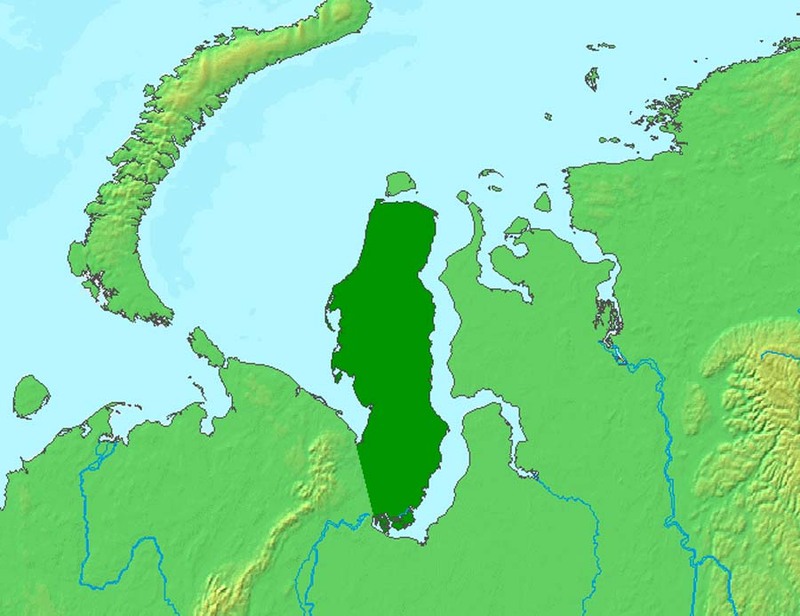 By way of their Finno-Ugric descendance, the Khanty people are related with the Finnish, Karelians and the Estonians. These fishermen were discovered in the 11th century by Norwegian researchers. Nowadays their life-style is endangered by oil extraction, too. 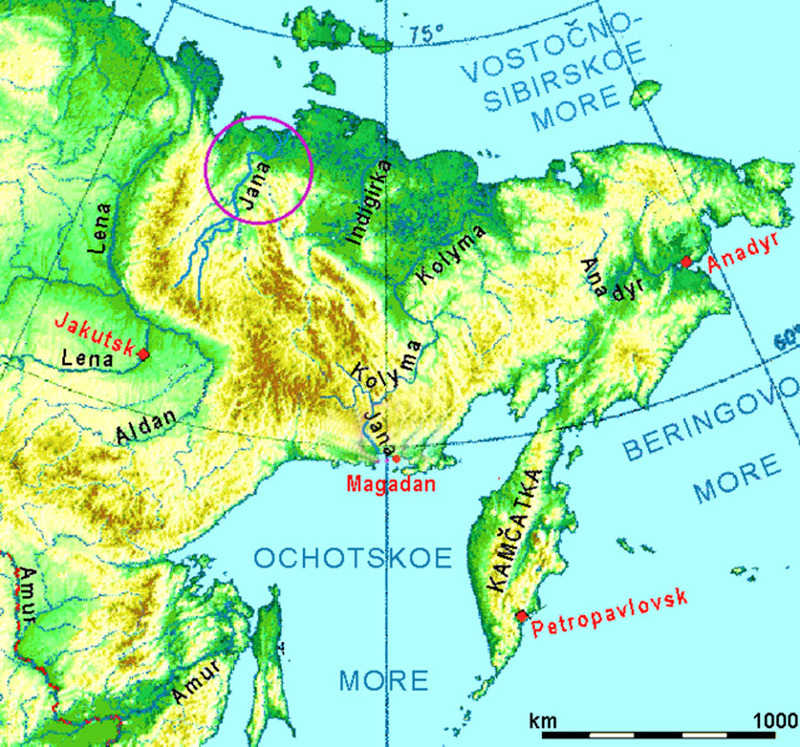 Evenks (Tungusic people) and Evens (Lamuts) in the 11th and 12th centuries still settled in the Baikal region. Close relatives are the Nani (also called: Nanei, Hezhen, Gold or Samagir), who settled at the Lower Armur and whose ancestors belonged to the Jurchen people (later on designated as Manchu). They were expelled by the immigrating Yakuts, a tribe of Turk dominated by horse nomads, or they moved farther north to the Tunkuska, to the shores of the Sea of Okhotks. In the first half of the 17th century, they were integrated into the Russian territory by the conquest of the siberian area, when they were given the name Tungusic people. This name was formed in the first century B.C. from the designation dun-khu (from Mongolian tung = forest) or maybe later from the designation of the Yakuts tong uos ("people with frozen lips", which also means "speaking in a foreign language"). There are severaly hypotheses about their origin. 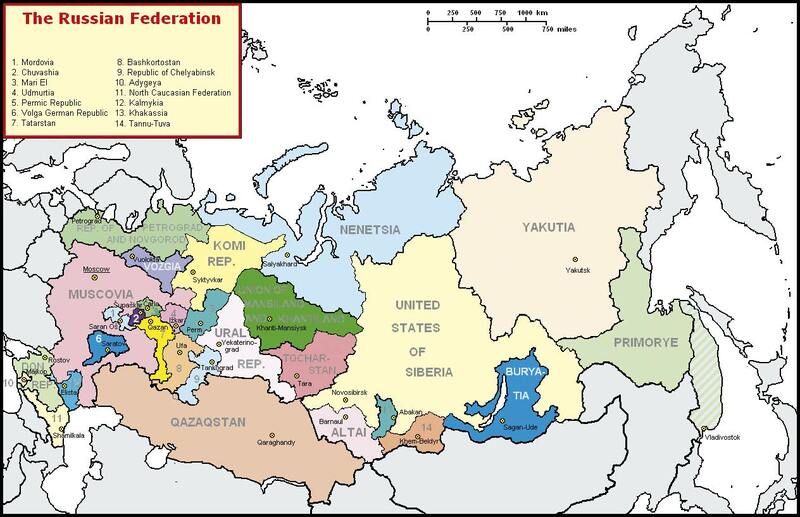 One thereof is based on Transbaikalia and the region of the Upper Amur. As Chinese sources have it, there supposedly immigrated in the first century B.C. a small tribe, the Uvans, living on cattle breeding into this region, who then mixed with the population already settling there; the settlers there already spoke a Uralic language and wandered around on reindeer sleighs. The Uvans then temporarily formed alliances with the Turk tribes coming from the south or with the Jurchen people (1) and also with the Mongols in confederations; this all ended with the arrival of the Turk speaking tribes of the Rouran (2) (who are said to be ancestors of the Yakuts (3), emigrating in the 9th century into the Baikal region and into the region Transbaikalia). This initiated the further displacement of the Tungusic people towards the north, who then settled in the Sibirian Taiga, to the west and the east of the Baikal, anlong the rivers Lena and the Lower Tunguska. The association with the Mongolian tribes and the formation of the Mongolian Realm with conquests in the 12th and 13th centuries created a stimulus for the migration from the Baikal to the rivers Lena, Aldan and to the shores of the Sea of Okhotks. From these migration waves there were then formed new clans of various groups with hunters, reindeer herders and horse breeders, with the last mentioned settling predominantly in the surroundings of the Baikal. They were called Khamnigan (Tungusic Horsemen). 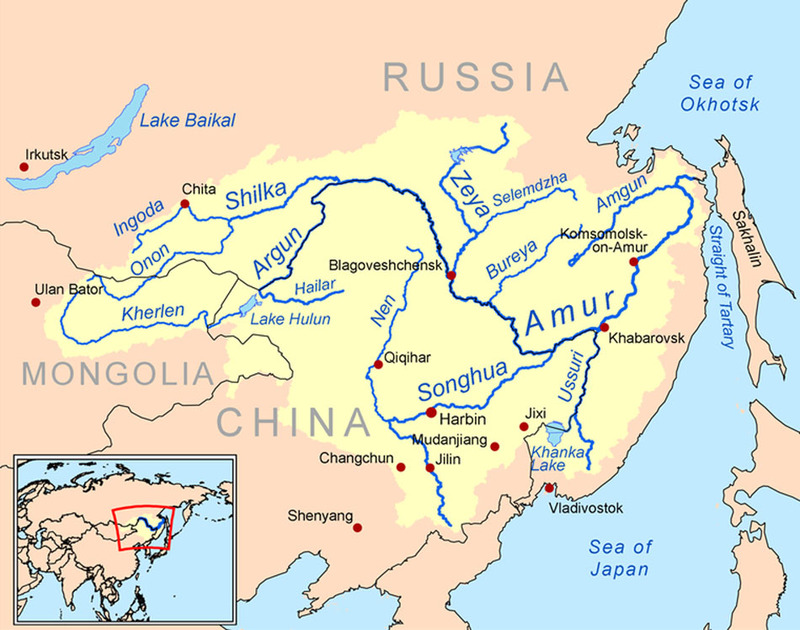 The Solon (Manchu-Tungusic people) continued to live in the Amur region and to the border to China. The Evenks and the Evens had patrilinear clans (tege), with a clan amounting up to hundred members of the same origin. They were in general designated after a common ancestor, and they were led by a respected elderman or a young warrior; but also by a well-experienceed hunter (soning), a shaman, a blacksmith (tavin), or simply by a rich reindeer herder. These groups domesticated reindeers, which pulled the sleighs for transports or carried heavy loads. The tribes of the Vitim-Olekma, Jukagir and Orochons had up to 100 reindeers and used them also for riding or hunting. They were very mobile and moved enormous distances in search of good grassing areas for their herds. During their halts in the calving season, they erected fences and created fire sites in order to keep off mosquitos and midges. They trimmed antlers, castrated reindeers and cared for the sick and ill. Reindeers were only slaughtered if the family suffered from a famine, if the hunt had been without any success, or if they had no luck when fishing. They mainly lived on fish and deer. They drank tea before their meals. They preferred cooked meat in a broth, while meat and fish were roasted on rods. In summer they consumed maire's milk, which was added to tea and enriched with berries and which was also used for making butter. Gathering was only a secondary task. The steppe tribes practised nomad breeding (horses, sheep). They lived in local groups and had blacksmiths, and they processed bones, horn, animal hides, and they carved wood. They further produced househould accomodities from wood or birch, and they made meshes for fishing from nettles. They built birch wood boats, produced covers, saddles, sleighs, skis, carpets and saddle bags. Their clothes were made from reindeer skin (rovduga) or other fabrics, with the clothes being decorated with belts made of fur, fringes, horse's hair, metal medaillons and so on. The women had their hair knotted on the top of their heads, wrapped by pearl bands (chireptun). They hunted hoofed and fur bearing animals, practised seasonal fishing (summer and winter), and in the Taiga they lived on reindeer breeding. There were also groups who practised a semi-nomadic or nomadic life style. Their annual movements from one grassing area to the next were interrupted when it was calving or mating season. These interruptions were used for hunting or fishing. In summer, they moved to higher situated grassing areas in dry territories (at the ridge or on the hillside), in autumn and spring they were mainly living in basins, near lakes or forests. These annual cycles were determined by local weather conditions and the climate. In December and in July, there were organized big clan gatherings on the occasion of midsummer celebrations, which were called suglan. Traditional songs and round dances developed into a repertory of its own and have assumed important functions within the tribe or the family or on the occasion of Shamanistic holy days. The melodies for the dance were improvisations and adapted to the tempo and the rhythm of the circle dance movements. Each regional group developed its own dances. The Evenks also include lyric songs, dance songs, hymns, Shamanist ritual songs and instrumental music in their traditional folcloristic repertory. The songs are in general designated as "Iken" (ik = to sound). Instruments were used for spontaneoulsy improvised music, and some forms, especially wind instruments, were used by hunters to attract animals. Instruments were used while working or in the leisure time, and they served ceremonial rituals. The music was performed on a pluriarc having a can as a soundbox (such as the Mongolian khuuchir) or on a twelve-string box zither. Also a lute having one, two or three strings was used. The Jew's Harp originally consisted of a tendon which was used as a string, the one end of which being held by the teeth of the player and the other one being stretched over the thumb and plucked by a finger of the free hand. Their traditional nature religion was cleary influenced by Shamanism, apart from the worship of the fire. The Evenk tradition is considered by modern research as a classic, typical form of a nature religion. The term "shaman/chaman/saman" has its roots originally in the Evenk language (Manchu-Tungusic). The world is seen as a river, with its sources being the Heaven and which flows through the world of the peoples. Shamans were a kind of medium, mediators between man and the spiritual world. They called upon helping spirits and used their help for healing the sick and the ill, for finding lost things, for predicting the future, for providing protection for the children and the herds, for easening the pains of giving birth, for granting hunting luck or for accompanying the souls of the deceased into the world of the dead. Their clothes were decorated with medaillons, pictures and iron beads, their heads were garnished by reindeer antlers. They also used drums and rattles, and in their sessions relied on assistants. There were developed contacts with immigrating Russians in the early 17th century. Inter-tribal conflicts between the clans were ended, and this constituted the beginning of mass emigration in the search of new hunting territories. 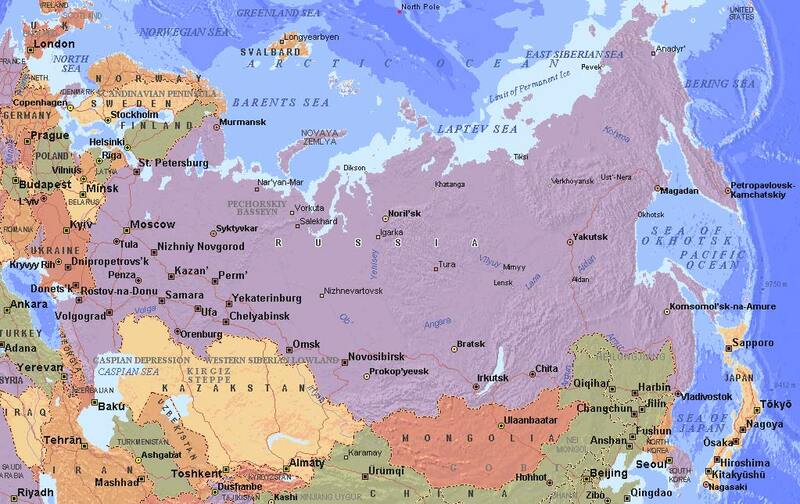 The Russians were mainly farmers and settled along the rivers at the Middle Yenisei, Lena, Amur and the Upper Tunguska. In this way, the Evenks were displaced from these fruitile grassing grounds, towards the north. Until the middle of the 17th century, the Manchu (earlier Juchen peope) formed larger groups at the right shores of the river Amur, and they were reindeer or horse breeders. In the 18th century a part of those settling in the Transkbaikalian region was assimilated by the Buryats. In the 19th century some of them migrated to the coast of the Sea of Ochotsk and to the rivers Uchur and Amgun in order to flee smallpox epidemics. Some of them migrated to the region Primorje (at the sea), to the river Tumnin, there uniting with the Dueges and the Oroch people (Nanai) and later on moving to the Sachalin Islands (see map  Amur). In 1930 there were developed the autonomous okrugs covering a huge and not very densely populated territory in the Central-Siberian mountains. 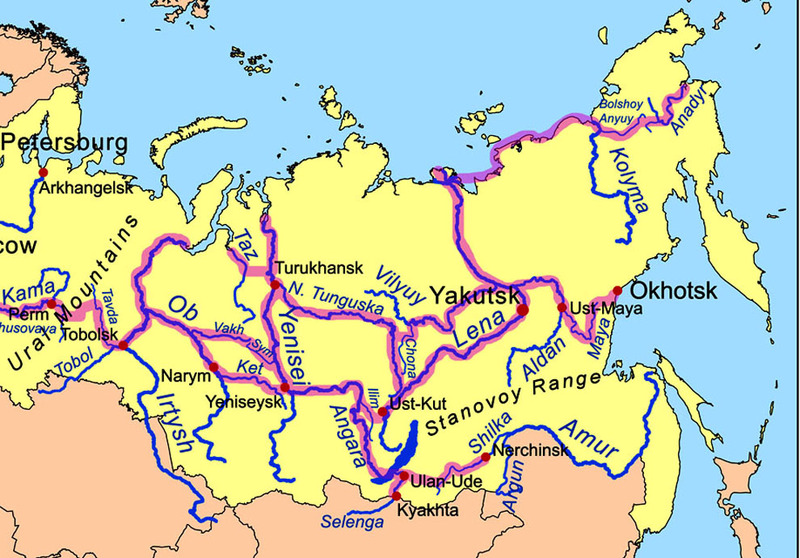 The most important rivers are the Lower Tunguska and the Stony Tunguska, both being affluents of the Yenisei river. The surface of the okrugs is rather mountainous. The Evenks are mainly reindeer breeding nomads, and their religion is a form of shamanism in combination with a syncretic world concept (mixture of religious Ideas with philosophies). The Evenks, which are also called Evenki and Tungusic people, are a "small people" that has developed from numerous regional groups and clans. They live within the Siberian area, distributed over an expansive territory being larger than Europe. There are individual smaller tribes in other regions, such as in the autonomous okrug of the Chukchi people, the Koryaks and on the Sachalin Islands. The tribes of the Duege settle at the Amur and the Ussuri (see map  Amur). Related groups are also the Nanai at the lower Armur and the Evens (Lamuts): Relatives, the Tsataans (Dukha), live also in Mongolia, at the Yenisei spring, and in the People's Republic of China, especially tribes of reindeer breeders and cattle breeders, the Solon and the Orqui people, who are still living a nomadic life style. These groups developed from an assimilation with Manchurian, Mongolian and Turkic tribes and are considered the oldest people already settling in Siberia rather early. Their origin is in the area of the Middle Yenisei up to the Lake Baikal and in the Armur region, where today there are mainly settling Buryats. Their language is one of the Manchu-Tungusic language family. This term is a summarising designation for peoples or groups, among whose ancestors the Manchu-Tungusic language was used. Although the language is more similar to the Chinese, they are closer related with the Mongols and the Turkish in terms of culture. Tungusic languages and cultures do make sense, as the people recorded information on their history, language and culture by way of collecting stories: such that is contained in oral traditions, with their clan name, their songs, their artefacts, and so on. The Evenk dialects of the Solon, Negidal and Oroch people (together with the fifth "Northern Evenk dialect) and with that of the Nanai, Oroq, Ulch and Kile are considered the dialects of a language. Tungusic languages are probably more similar to the Portugues line than to the Mandarin-Cantonese language. Arman is generally a dialect of the Evens (Lamuts). The Orochian language is in general seen as a dialect of the Evenks by Non-Chinese linguists. Kile may in general be a dialect spoken by the Nanai. Sibe is considered to be a dialect of the Manchu (Jurchen) people - by some Non-Chinese linguists. The Manchu language was one of the official languages of the Tungusic-Manchu Qing Dynasty (16441911). This being the most far-spread scripture and literature language in the 17th century - based on Mongolian examples), there was developed a script which was also used for notable literature. Already the ancestors of the Manchu, the Jurchen people, had used their own script on the basis of the script of the Proto-Mongolian Kitan in the North-Chinese Jin Dynasty (1114-1234). 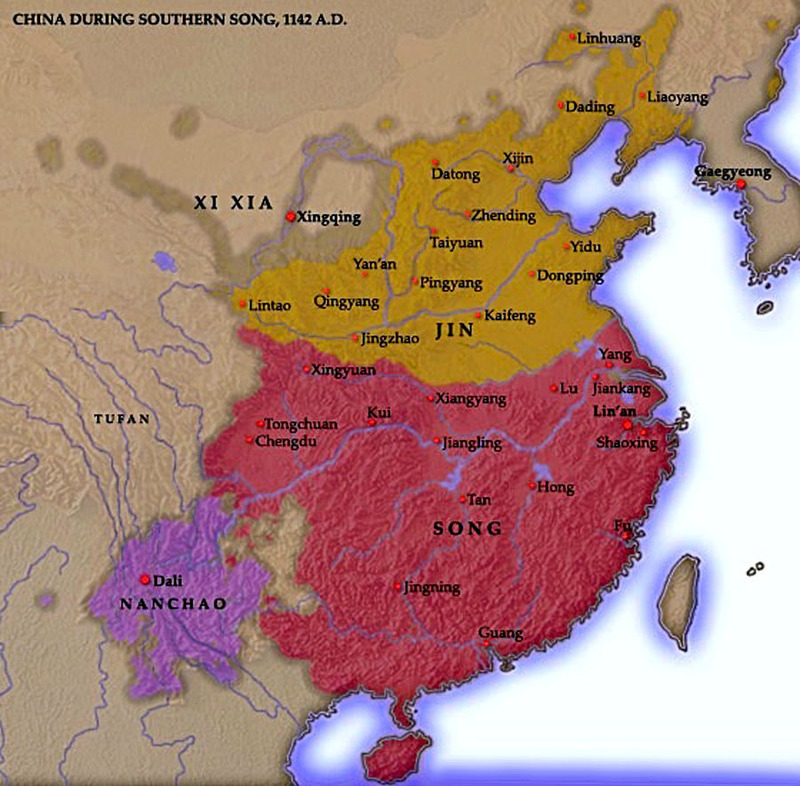 Their territory was later on concquered by the Mongols, such as that of the later Song Dynasty. In this language, there were also found remnants of manuscripts and inscriptions as well as individual words in Chinese chronicles dating back thereto. The Sibe language, which had developed from the Manchu-Tungusic language, is still rather common in Xinjiang in the Ili area. The Xibe (Sibe) still use their own script, which is a slight deviation of the Manchu script. Tungusic riding peoples were partly also called Tatars, but they do not have any links with the Russian Tatars or the Mongolian tribe of the same name; throughout the Middle Ages, these remained a stable political factor in Manchuria. Since the end of the 1920ies, there is a standard script for the Evenks in Russia; it is based on the Cyrillic script. But nowadays, however, many people already speak a Russian, Yakut or Buryat language. Those settling the far north still live on nomadic reindeer breeding, hunting and fishing; they still live in tents. But in the course of colonization and the foundation of the state farms of Sovkhoz many people settled down, with certain tradition still being practised. Other groups such as the Horse Evenks (probably mixed with the immigrated Yakuts from the Altai) or the Solon people in China today mainly live on cattle breeding and farming. Unemployment and social problems like alcohol are being dominating factors for everyday life within the Russian Federation. Some people have found jobs in the Siberian oil and mine industries. The Paleo-Siberian groups, which also include the Chukchi people, were expelled from the south towards the north; now these are living on the Chukchi Peninsula: The Tundra Chukchi with reindeer herds and the Coastal Chukchi, which have laid their focus on hunting whales and seals. It is not known when the first people settled there, but archaeological findings make us assume that the first settlers of an existing Bering Landbridge settled in this area and also in Alaska. These people are related with each other, not only in regard to the geological situation but also in regard to the way of living practised by these people. This is confirmed by a number of features that are common with the indigenous population of Alaska as well as that of the Chukchi Peninsula. Settlement had to endure harsh climatic conditions as it was the time of the so-called last "Sartan Ice Age" (1). Life was concentrated mainly in the Tundra zone in the area around the glaciers and in the valleys between these glacieres. At that time mammoths were grazing there, woolly rhinos and aurochs, remnants of which are still being excavated. The main tasks of the tribes were hunting, fishing and gathering. Gradually a part of the peoples began to practise reindeer breeding as herders (especially the immigrated continental Chukchi people), others (such as the Eskimos and the Coastal Chukchi people) lived from the sea. (1) The Sartan Ice Age 12,000 (13,000) to 23,000 (25,000) years ago was the last part of the Pleistocene period. It was the coldest part of the Ice Age (Sartan, Late Valdai, Late Wisconsin). Numerous radiocarbon data from different Siberian areas and from the northern hemisphere indicate that it became very cold some 22,000-23,000 years ago. 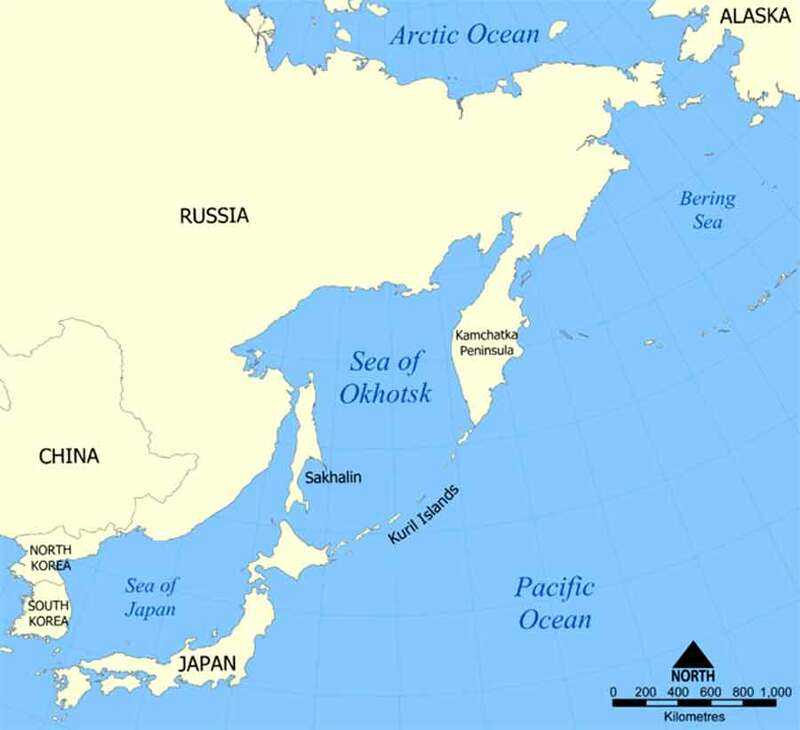 The Chukchi Peninsula  is situated in the extreme north-eastern part; it is an open wedge-like peninsula between the Pacific Ocean and the Northern Polar Sea. 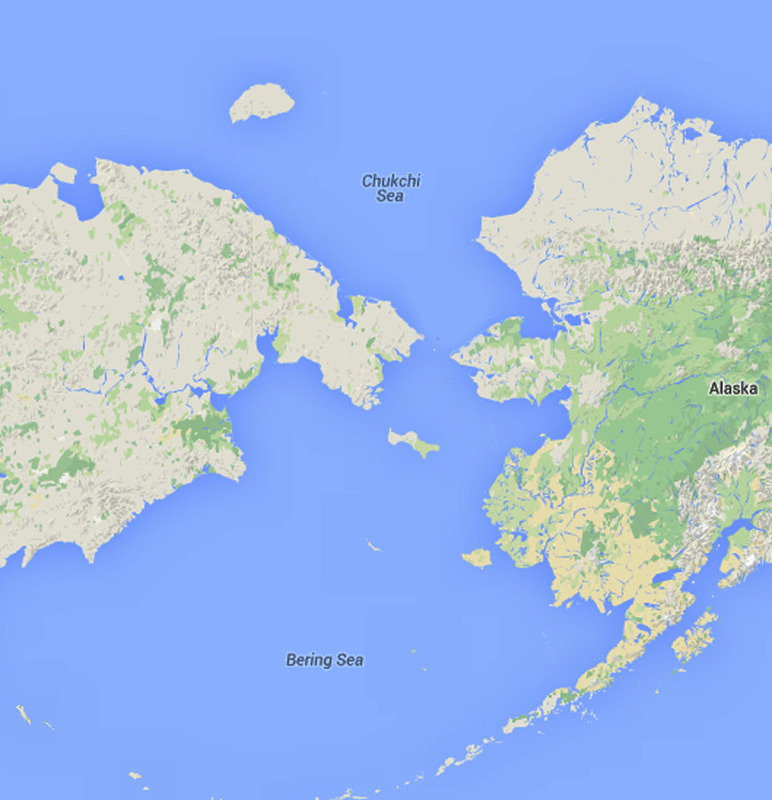 The narrow Bering Landbridge forms a separation to Alaska. Some 30,000 years ago they had been an entity, which was then separated by natural forces. The indigenous people included the Chukchi people, the Eskimos, the Evens, the Chuvash people, the Yukaghir people, the Koryaks and the Kereks. All these have a different origin and belong to different language groups. The biggest area are the mountaing ranges, the highlands and the plateaus. The valleys and basins are composed of swampy (forest) Tundra. 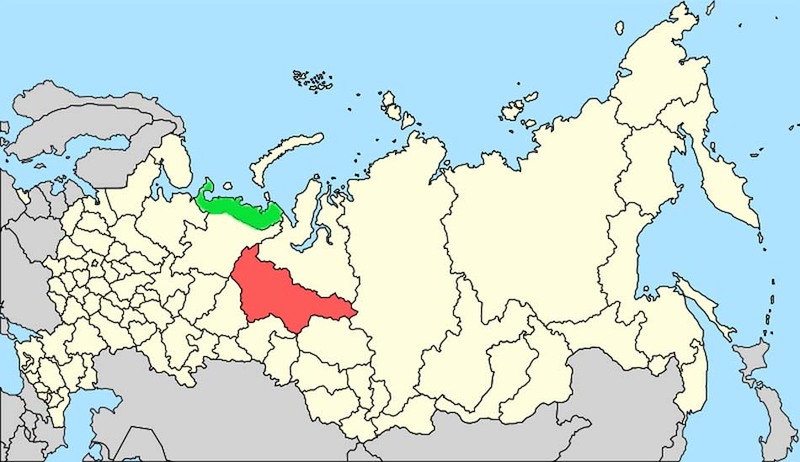 The southern and the western part of the autonomous okrugs are limited by the well-known river Kolyma. The largest rivers Anadyr includes a variety of lakes. The Lake Elgygytgyn having a depth of more than 160 metres is considered an important natural monument, which was supposedly formed by a meteorite impact. There are also existent some dead volcanoes. Winter lasts eight months. The climate is rather raw: at the coast there is maritime climate with strong winds, which often turn into snow storms; on the mainland, however, there is continental climate. In winter temperatures may reach -60 degrees Celsius, average annual temperature is about 12 degrees. The northern part of the territory is situated beyond the polar circle, there is permafrost soil nearly everywhere. Flora is rather sparse: in the Tundra you may find moss, flechen, sedges, bushes and small trees, in the river valleys and in the southern parts there are deciduous trees, birches and poplars. Fauna has adapted to raw nature. There are mainly northern reindeers, elks, muttons, ice and brown bears, polar wolves, wolverines, foxes, sables, eagles, polar chicken, wood grouses and in summer there are cranes, geese and ducks. In the seas there are to be found the walrus, seaks, whales, and in freshwater areas there are existent graylings, the Siberian salmon, the Omul and other salmon-, vendace and carp-like fish. In the Chukchi Peninsula there have been established several nature reserve parks. The reindeer breeders lived in a polygonal spacious tent, which is called Tshum and which is covered by reindeer skins and which may then be easily transported. In the middle, there is placed a fire for cooking. This smoke also helps in keeping off the mosquitos and escapes through an opening in the roof. On the floor, there are placed several layers of reindeer skins, which also serve for sitting down. In front of the tent there are arranged sleighs, which are called Narty and which are loaded with tools. Next to the main tent there are arranged several tents for sleeping. The women have to do the most of the work. It is their task to cook the meals, to sew the clothes, to prepare the tents, to gather firewood and to assist the men with herding. From September on the people wear an overall made of fur. In winter, they wear two overalls, with the inner one facing the body and the upper one towards the outside. Reindeer breeding, fishing and hunting are the basis of their way of living. Keeping big lifestock provided for food, clothes and shoes. The reindeer was the centre of their material and spiritual culture. They lived as nomads and moved from one place to the next one in search of new grassing areas. They moved on every 18 to 19 days and loaded everything onto their sleighs. The routes they had travelled the year before were avoided in order to prevent overgrazing and to fatten their reindeers. At every resting place there are slaughtered two animals, and the meat is stored in a permafrost hole of 30 cm depth. Interruptions of their wandering is conditioned by the season, by the quality of the grassing fields and by several other circumstances. In the course of the year, the herds will separate several times, and they subsequently meet again. Each group has a wandering route of its own. Knowledge on grassing conditions and selective breeding is handed over from one generation to the next one, thus promoting the good health and quality of the herds. Reindeers are actually semi-wild, anxious and very fast animals. Grassing is therefore rather difficult for the herders. There have to be crossed many kilometres, small volcanoes, swampy areas, rivulets and snow fields. Mosquitoes are very burdensome, and fungi are dangerous. Sometimes, there is given the danger of wlld reindeers which are bigger and stronger, with these often entrailing the domesticated animals. It is nearly impossible to stop these animals. In earlier times, nobody would have dared to stop these animals, as everybody had great respect. The people rather tried to convince the animals to stay with the flock. At the utmost, they threw lassoes, tickled the animals - and they were successful. In earlier times it was also prohibited to use dogs when herding. Years of experience with herding and good knowledge on the habits of the animals were the basis for good herding. Scouts were sent trying to find the herd. For this, it was absolutely necessary to have a good eye and a sharp ear. There were further always waiting numerous predators (bears, wolves and wolverines). In autumn the separated groups find together again, then using the paths of autumn and winter, when in August and September the reindeers are driven together. Then there is practised the annual slaughtering, wherein the herd is reduced by a third in order meet the lower capacity of the winter grassing areas. Meat, which in former times was bought by the sovkhos, now has to be sold by the people themselves, which, however, is not very economic due to the high transport costs (partly by way of helicopters) and the low sale prices. Their style of living has not changed very much, especially in the far north-east. At the times of the Tsars, the northern peoples had to pay a fur tax, the so-called Jassak, which reduced the time and energy for their own struggles in making a living under unfavourable conditions. This resulted in poverty and poor living conditions. Life expectancy for men was about 30 to 40 years. The indigenous population has adapted over the course of many centuries to the narcotic effects of fungi, and they have developed a rather strange culture of using this natural product, although alcoholism has definitely led to destruction. Stories today tell of "naïve and rather limited people". In this way, the Chukchi people have developed from a freedom seeking tribe gradually into a horde of dirty, lecherous and alcoholic brutes, at least in the imagination of the conquerors. The term "Chukchi people" then got the meaning of "dullness". The many cases of illness and a high suicide rate are rather prominent. Nevertheless, in the souls of the indigenous population of the Chukchi people there are still present islands of ethnic memories, which represent themselves in the world concept of customs, traditions or in artistic pieces of work. Patterns and details of traditional clothing, the shoes decorated with pearls, these all have been sewn together for daily use. These people do not base their artistic activities on handicraft knowledge but rather on their heritage of feelings for the beautiful and the important of their homecountry. In earlier times, the women, the old and the toddlers were separated from the herd of wandering herdsmen, and they formed a summer camp at an idyllic site. Usually, they sought sites in the vicinity of a river full of fish, surrounded by bushes or a near forest, which then provided for wood. Women and children worked on furs, sew clothes, gathered food in the form of root plants, they dried fish; the old men produced reindeer sleighs and dishes. In this way, they all prepared for the winter. In spring, in the time of calving and in the advance thereof, the breeders of various groups met again, helping each other when separating dams. There were organized festivities on the occasion of the birth of the first calves. This was a very joyful and carefree time of the year. Wild reindeers were hunted, races with horses and sleighs as well as wrestling matches were organized. The life of the coastal tribes was not any stranger along the entire coast of the Bering Sea and the eastern part of the coast of the Chukchi Sea. Whales, walrusses and seals were hunted. In earlier times, the harpoons were made from walrus teeth. Harpoons with rotatable ends were even then considered masterworks of tools for hunting. Hunts were seasonal - in summer with the aid of boats, in winter on ice. Hunting products formed the basis for food and clothes of the coastal population. There were celebrated many festivities, with the whale festival being the largest one. Their religious concepts are the Animism, that the Creator has created man apart from many other living beings. Those people who had died in dignity (in war, while hunting, etc.) were allowed to enter the heaven spheres, those who had died without dignity (illness etc.) would go to the Lower Sphere. This is the reason why a variety of ghosts and spirits is present, who may help or harm the living ones. In the rather complicated and unknown world, where an invisible "landlord" could be residing behind any tent pole or under any ground pile, people had to be extremely careful. In their daily activities, the people had to learn to live with the help of their experiencees and knowledge. "Prayers" and personal amulets help and serve as life protectors. Nevertheless, there will sometimes ocurr extraordinary cases, e.g. when an evil strong spirit kidnaps the soul, and in this case it it necessary to get the help of a healer, who is gifted to immerse into the world of the spirits and to perform there actions to save the robbed souls. Such a man Is the shaman.